The jury for the prestigious Red Dot Design contest has recognised the TORSIOTRONIC® electromechanical torque screwdriver by STAHLWILLE with the Design Award in the product design category. In so doing, the jury honoured, in particular, its functionality, ergonomic design and the underlying innovative concept. This is the only torque screwdriver with electronic measuring that features a genuine mechanical trigger system, which, thanks to the patented ball mechanism, gives the user an unmistakeable tactile stop signal when the digitally set target torque has been reached. This makes the TORSIOTRONIC® the world's only torque screwdriver that blends the advantages of digital technology with those of a mechanical trigger. This is ideal for all fastener tightening operations where maximum accuracy and reliable logging functions are required. The tool celebrated its launch at the beginning of March at the International Hardware Fair in Cologne. Intuitive user guidance coupled with a bright OLED display, that also scores due to its broad, user-friendly read-off angle, ensures simple operation and fast parameter setting. A visual appraisal of the tightened fastener is given on the display and the laterally positioned LEDs. With the aid of a PC and STAHLWILLE's SENSOMASTER 4 software, programming individual fasteners and complex work sequences is a simple matter. The electronic torque screwdriver can store up to 2500 tightening operations and transfer these to the PC. The mechanical functions also leave nothing to be desired: the mechanism consists of a fine-tooth ratchet with 80 teeth and a correspondingly tight ratcheting angle that provides smooth operation and high load capacities. TORSIOTRONIC® works in both the indicating and clicking modes and in both directions. As soon as the preset tightening torque is reached, the screwdriver triggers with tactile and audible signals. After the tool trips, the slip mechanism prevents the preset tightening torque from being inadvertently exceeded, which protects against overtightening. The Red Dot Design Award has been presented since 1954 and the Red Dot logo is a quality seal recognised the world over. Only those products that impress the jury with a number of evaluation criteria – from the degree of innovation and functionality, quality, ergonomic design and durability through to environmental compatibility – are in the running for an award. For STAHLWILLE this may be the first Red Dot Design Award – but it is not the company's first ever award. 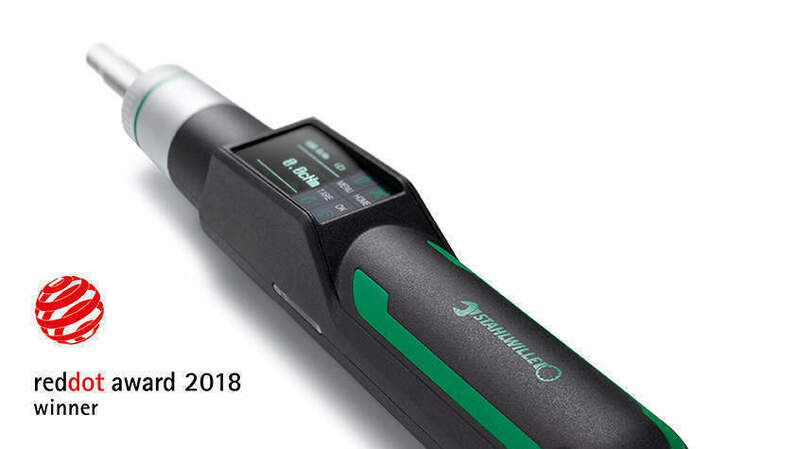 This manufacturer based in Wuppertal, Germany, has also won the coveted iF Design Award: in 2011 for the motorised "perfectControl" calibrating and adjusting unit, in 2013 for the electronic torque and angle-controlled MANOSKOP® 714 wrench, in 2014 for the TTS Tool Transport System and in 2017 for the SmartCheck torque tester. "The fact that we have won the Red Dot Design Award is a tremendous success story and confirms our commitment to delivering innovation as it is perceived by users", enthused Winfried Czilwa, Chief Executive Officer of the STAHLWILLE Group. "We are grateful to the jury for their decision and see the award as motivation to continue our innovation drive and never to lose sight of the needs of our end users."